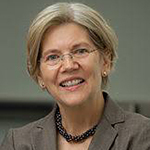 In an Aug. 21 National Press Club speech, Warren noted that trust in government dropped from 73 percent in 1958 to 18 percent today, according to the National Election Survey polls. “A loss of faith this broad, and this profound is more than a problem—it is a crisis. A crisis of faith,” she said. Warren wants to “padlock the revolving door” and increase public integrity by instituting a lifetime ban on lobbying by the president, cabinet secretaries, members of Congress, federal judges and other senior government officials. The legislation also would prohibit government officials from owning and trading individual stocks. Warren would expand the definition of lobbyist to include anyone who gets paid to influence the government. Warren’s bill would end what she calls “legalized lobbyist bribery,” by prohibiting lobbyists from writing campaign checks or giving personal gifts to anyone running for or holding a federal office. The Senator knows that her legislation faces tough opposition. She said that’s the negative thinking that allowed corruption to spread through Washington for decades. Warren vowed to fight for as many of her reforms as possible.